What is the South Atlantic Anomaly and what does it have to do with Earth’s Magnetic Poles? Read on to learn more about this fascinating topic. The Earth’s atmosphere protects the planet from the radiation of space. We cannot see the radiation with the naked eye, but special telescopes detect gamma and infrared lights throughout the universe. The South Atlantic Anomaly occurs where the Van Allen radiation belt comes closest to Earth’s surface. It stretches a great length from Chile to Zimbabwe. In 1958, James Van Allen, an American scientist, discovered two radiation belts. These belts form when charged particles from the Sun and its cosmic rays get trapped in Earth’s magnetic field. As a result, the magnetic field deflects the energetic particles. Furthermore, they protect the atmosphere from destruction. The belts became known as the Van Allen belts. They extend from an altitude of about 640 to 58,000 km (400 to 36,040 mi) above the surface. At this height above the Earth, the radiation levels vary. From his research, he established the field of magnetospheric research in space. 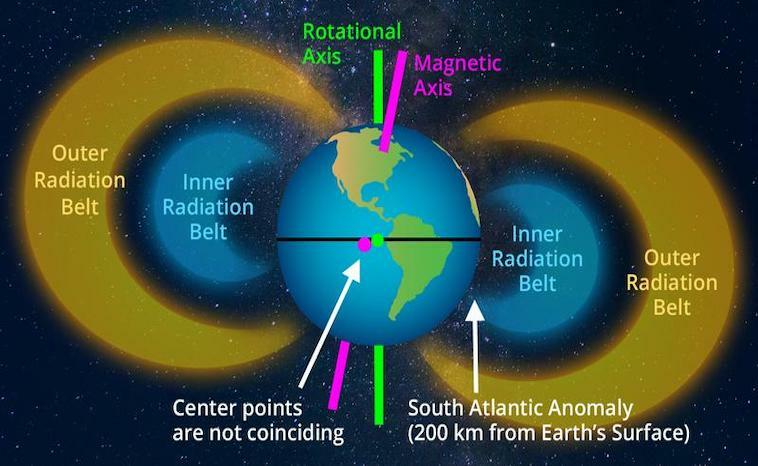 The Van Allen radiation belts lie symmetrically around the Earth’s magnetic axis. This axis tilts along with Earth’s rotational axis at approximately 11°. Earth’s magnetic field gives us our north and south pole. In addition, it’s also what protects us from solar winds and cosmic radiation. The intersection between the magnetic and rotation axes of the Earth is located not at the Earth’s center, but some 450 to 500 km (280 to 310 mi) away. The Earth’s spin creates an area which places the Van Allen belt close to the Earth’s surface. How close? The belts dip down 200km (120 mi) in altitude. Aside from creating issues for satellites and astronauts on the ISS passing through the anomaly, the SAA may indicate a shift in the magnetic poles. How does this weak area affect satellites? In 2016, Japan’s revolutionary Hitomi X-ray observation satellite passed through the area with disastrous results. Strangely enough, the satellite spun out of control and therefore could not complete its mission to study black holes and supernovas. Scientists believe that the South Atlantic Anomaly continues to grow as the magnetic poles begin to shift. However, not all scientists agree. In April 2018, a new study in Proceedings of the National Academy of Sciences of the United States of America, scientists argued this anomaly occurred before without a pole shift. The Laschamp excursion occurred 41,000 years ago. During this time, Earth’s magnetic field switched polarity for less than one thousand years, with the pole returning to its original polarity. However, scientists cannot determine how long the South Atlantic anomaly will last and how much more it will weaken. We can conclude that nobody knows for sure and more than likely none of us will see it disappear. On a side note, scientists are working to update the World Magnetic Model; five years ahead of schedule. The model helps with all modern navigation, from the systems that steer ships at sea to Google Maps on smartphones. Why do they need to do this? Researchers say the magnetic field is changing so rapidly that they have to fix the model urgently. You will need to draw your conclusion if the SAA has anything to do with the change in the magnetic poles.